Booker T spends his days at South Salem Elementary making the students laugh and smile. The school therapy dog that got the chance to travel to New York to compete in the Westmister Dog Show is back with an award! 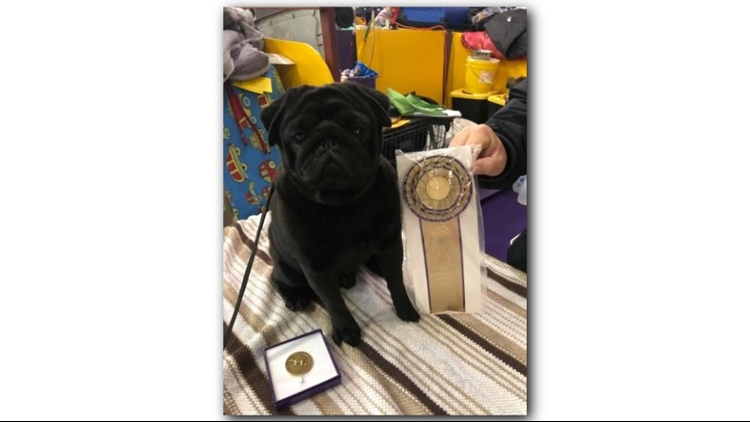 Although Booker T Pug wasn't chosen as a breed winner, the judge still presented him with an "Award of Merit". It essentially names him as one of the runners- up. "The best thing is that he offers a nonjudgmental being that kids can read to. If they get a word wrong, they're not going to tell him, if they have a speech impediment, they're not going to make fun of him. He's just simply there to listen," said Booker T Pug's mom, Meghen Bassel. 11Alive's Kaitlyn Ross got the chance to catch up with the therapy dog for her digital series, K9 Kait, before Booker left for New York. Bassel is the media specialist at the school and says he's quickly become a star. "I got him to be strictly a reading therapy dog, but his job has become much more than that," Bassel said. "He does do reading therapy, but he also works with students who are having a bad day or who need a reward." Booker had a spot in the pug competition that aired Monday, where he received the Award of Merit.